Dogs can bite. Their teeth can scratch, puncture, crush, rip and avulse living tissue. Children generally receive dog bites to the face because they are short. Adults are more likely to be bitten in the hand or leg. 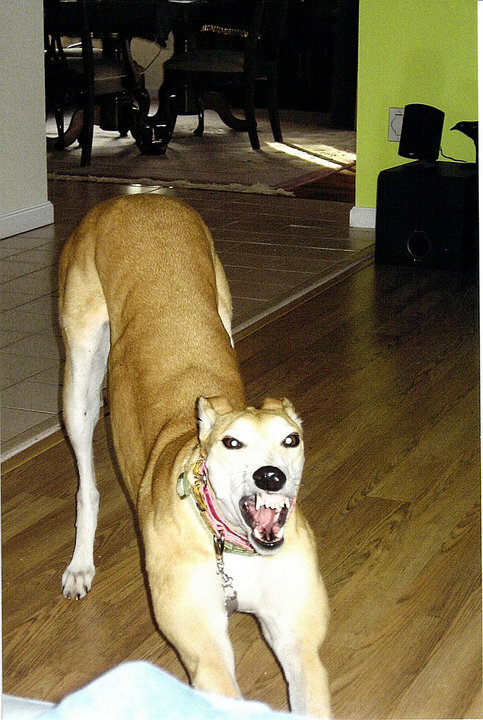 Obviously, the greyhound adoption movement wouldn’t be such a success if the breed has a high level of aggression toward humans. 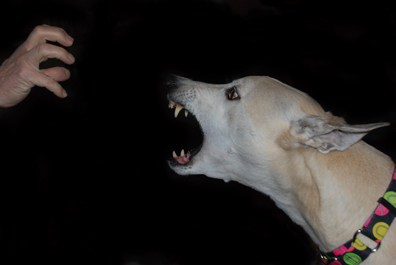 I am aware of a number of greyhound bite incidents and that greyhounds that are exhibiting aggressive behavior toward people. I’ve developed respect for the power of dog jaws and teeth from working as an occupational therapist/hand therapist for six plastic and hand surgeons in their office and surgery center for the past sixteen years. We have a steady trickle of clients with dog bite injuries. The miracles of plastic surgery may still leave scars, and in some cases, a lot to be desired. The woman who leaned over to greet her employer’s dog and had her nose bitten off will never be quite the same. Nor will our current patient who lost the end of his thumb from a dog bite. A large percentage of dog bites seen by our surgeons are not done by the family dog. Often a child hugs a dog in public that it doesn’t know, or a child is bitten by a dog at a friend’s or relative’s home. Sleeping dogs who are startled generate bites. One woman who wrote to our office following surgery on her child’s face explained that her children had been tormenting the dog. She grieved for her euthanized dog which was in the veterinarian’s freezer until she could bury it in the spring. Usually it is obvious if a dog bite requires medical attention. However the severity of seemingly simple little puncture wounds created by dog teeth may be underestimated. Bites can create pockets in the tissue where bacteria is deposited and infection develops. Irrigation and oral antibiotics are methods of treatment for puncture wounds to dogs and people. People are also inoculated for tetanus if they are not up-to- date. In the last five years I have coordinated over eighty adoption demos, two reunions and have participated in a number of other large greyhound events. Fortunately I have never observed a significant dog to person incident in these situations. Greyhounds are greeting many strangers of all ages in unfamiliar often congested environments. Dogs who have been exhibiting aggressive behavior at home or who are fearful of people should not attend. It puts the adoption group and the public in peril. Is It Aggression Or Something Else? How can we prevent dog bites? We can prevent dog bites by observing our dog’s behaviors, understanding the early signs of aggression and nipping it in the bud with appropriate leadership training. Brian Kilcommons and Sarah Wilson state in their article “Recognizing Aggression” that aggressive dogs usually start with simple disobedience. They move on to challenges, threat gestures, growls, snarls and then a bite. Some of the warning signs of aggression they note are: ignoring known commands, bumping into family members, refusing to get off the couch or bed, stopping eating or chewing when approached and tensing up, hiding under the furniture and growling except in play. 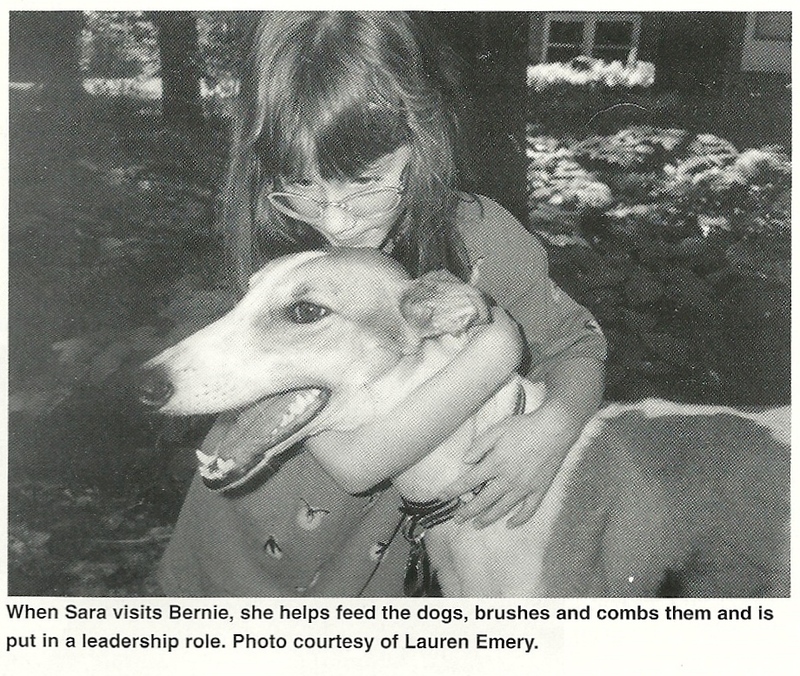 I spoke with Steve Duno, animal behaviorist and co-author of the book Leader of the Pack to get his thoughts on retired greyhounds and people aggression. He expressed concern about retired racers going into homes with young children due to the dog’s history of lack of socialization. He would prefer to see them adopted by families where the children are old enough to participate in their care, i.e., eight to ten years old, so the children can play a leadership role. He has had families with retired greyhounds and children consult him and has had the parents establish ground rules regarding the dog: no pulling ears or tail, no laying on the dog, and no disturbing it while it’s sleeping and eating. He spoke about the tendency of many people to pamper and coddle rescued dogs and dogs from shelters. The attitude that “the poor thing has had such a hard life” can backfire for the dog and the owner. By showing no leadership, these people elevate the dog’s sense of self importance and reinforce its aggressive behavior. Is It A Dominance Issue? Although I’ve lived with dogs most of my life I found Nancy Baer and Steve Duno’s book Leader of the Pack to be quite enlightening. The authors stress basic obedience training as a foundation. Their book outlines very easy-to-understand, non-confrontational methods of leadership to be followed in the home. They deal with the problem of aggressive behavior by dogs on beds and furniture very clearly. By letting the dog sleep on your bed, couch or easy chair, they say, you are communicating to the dog that he is your equal and can challenge you. The leader of the pack always sleeps in the highest, warmest, most comfortable place. They feel that moving the dog out of the bed is one of the most critical steps in gaining leadership when dealing with an aggressive dog. Baer and Duno stress not to let the dog sleep with children as the dog may see them as “littermates,” may not develop respect for them, and might use aggression to discipline them. If the dog is to get up on the bed or couch, he needs to understand these items don’t belong to him and to get down when you say to. Although most dog bites seem to occur with no warning, there generally have been behavioral indicators that owners have not understood or have ignored. If the dog’s aggression is not related to a medical condition, it is usually correctable if caught early, but aggression will not go away on its own. By teaching the dog that you are the leader, you will curb its aggressive behavior and prevent a potentially serious incident. Hi Krissy. It’s hard to tell from afar what’s going on but we had a somewhat similar experience with our newest hound, Graham. He’s the world’s most pleasant dog but if anyone touched his bed while he was sleeping he’d show us a classic case of sleep aggression; we had our share of skin tears – no punctures though. We got him in 7/09 but he seems to have outgrown it. I still make sure he’s awake if I need to touch him. I’m wondering if Reba will calm down with the IGs in time. Unfortunately, you can’t risk their life and limb so Reba may need to crate her when no one is home and keep a muzzle on her until you figure out what’s going on. I would be sure there’s nothing medically wrong with Reba. We once had a dog who would get extremely grumpy and would give others puncture wounds if he was ill with a UTI! Pulling front teeth seems a little extreme. It might be kinder to rehome her if there is nothing physically wrong with her. I’d try to find a good dog behavior expert have a look at her and see her interactions with the IGs. Good luck and keep us posted. My husband and I adopted Reba May 5 months ago and have fallen in love with our sweet girl. About 2 months ago, she got caught up in our doggie door and had a total flip out session, she ran upstairs to meet our Italian Greyhound, Cassidy. Cassidy must have snipped (we’re not sure what happened, really) at Reba and Reba had Cassidy pinned to the floor by the time I could separate them. If I hadn’t stopped her, Cassidy would have been killed. She had a pretty bad puncture and several other deep bites. Since then we have been putting a muzzle on her when we’re not here. That was working for us until last night when Reba attacked our second IG, Jim. I’ve been tending to poor little Jim today, he’s fine. But we are very concerned about the safety of the little ones. Reba is normally a sweet, well mannered dog. She just has bad moments, and when she does the little ones don’t stand a chance against those big teeth. I’m afraid of one more bad moment, but terrified of what would happen to Reba if she’s not with us. Someone suggested we have her front teeth pulled. Thank you for any advice you may have.